The first of OMD’s storytelling series featuring leaders on the ground in North Carolina as part of our pilot program. In this series, we shine a spotlight on local leaders in North Carolina, the state with the highest number of factory farms in the country, who are working to promote food justice; provide access to healthy, plant-based foods; support better environmental stewardship; and improve community health from the ground up. 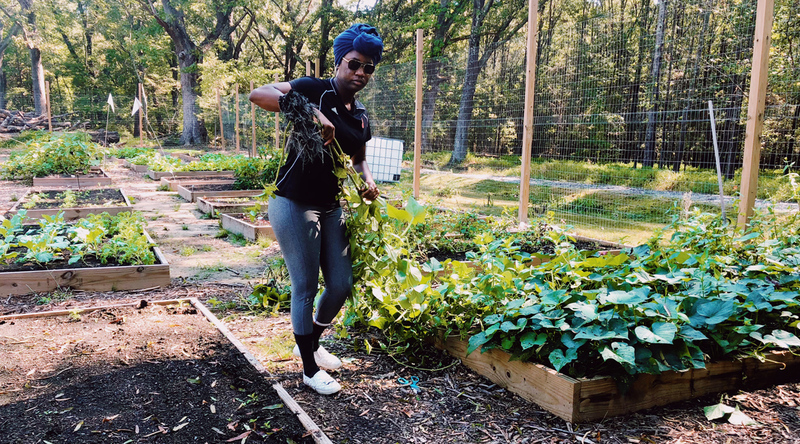 Our first installment introduces Delphine Sellars, co-founder and executive director of Urban Community AgriNomics (UCAN), a nonprofit focused on integrating agriculture into the health and well-being of urban communities. Based in Durham, N.C. 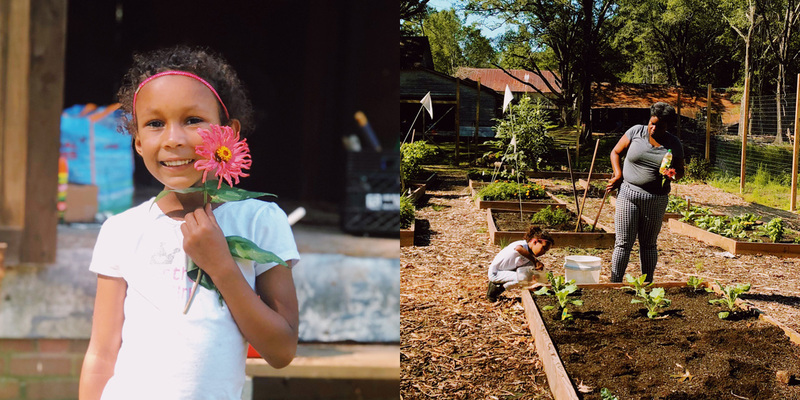 Since April 29th, 2016, UCAN has been restoring an estate that was once part of North Carolina’s plantation system, transforming it into a community garden. 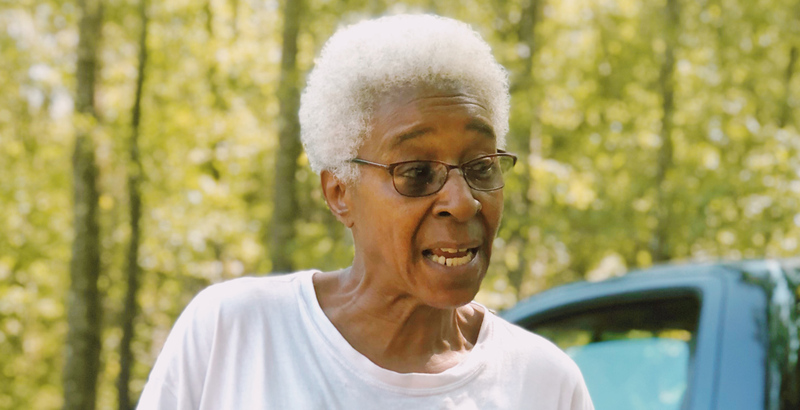 OMD’s North Carolina Field Organizer Zakiyaa Taylor interviewed her on the farm. How did your upbringing influence the work you’re doing now? I come from an eastern North Carolina town called Little Washington. My sister, Lucille, and I were raised by a single parent, my granddad, and we actually grew up on a vegetable farm. 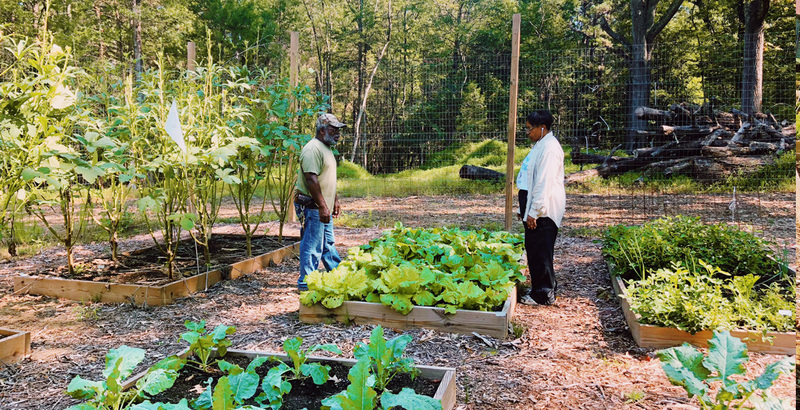 We were doing collards, cabbage, watermelons, you name it — we grew every vegetable we could. I thought going to school was my way out, and now look where I am. It’s funny. It’s funny the lessons that you learn. This property was once a plantation that was farmed with slave labor. Tell us about that history. The farm itself dates back to the colonial period. It wasn’t Black then, but we got history going all the way back to the colonial period. You can find history on everything else, but it’s hard to find our history. This winter when things settle down, it’ll give me a chance to research the Black side, the slave side. Why do you feel it’s so important to reclaim this space through gardening? Everything is connected to the land. When you’re made to do something and you don’t reap any of the benefits from it, you move away from it. So when a Black child said, “I’m leaving the farm” back in the day, Mom and Dad said okay. Most times, they didn’t own the farm anyway. So now we’ve got teach the younger generation, through a few of our seniors, to value this part of our culture, because we did devalue it a long time ago. We’re trying to get young people out here. Who can we instill this dream, this passion into? There’s nothing more valuable than land. I mean, if there ever was a time that we need to grow our own, it’s right now. "Our goal really was to make a difference in the lives of families in the community. And of the children!" Why does this community need hands-on agricultural literacy? There’s so much value in knowing about agriculture. It goes back to survival. If we’re serious about climate change, about decreasing our carbon footprint on this Earth, about everybody eating healthier and nutritiously, then we as the adults need to go back and instill within our children the value of eating well and growing your own. You don’t need 40 acres to do it. You can do it in a pot on your back porch. Agriculture affects every aspect of your life. Your mental health, your physical development — all of that comes from agriculture. And if we don’t value it and realize what we have, then we’re going to be lost for real. What was the initial vision for Urban Community AgriNomics? The goal was really to make a difference in people’s health. Mental, physical, you name it. For folks who are unhealthy, that unhealthiness can be reversed. You can reverse diabetes if you have a good diet, eat right, and take your medicine. You can lower your blood pressure through proper eating. Our goal really was to make a difference in the lives of families in the community. And of the children! Math is easier if I’m teaching you how to do a square foot garden. English isn’t that bad when I’m sitting down with you and talking with you about a plant that you might have problems pronouncing. Let’s work through it and pronounce it. What do you think the world can learn from you? What does an ideal world look like? There don’t have to be winners and losers. We all can reap the benefits and meet our needs, but we’ve just got to be willing to. That’s what UCAN has taught me. It’s also taught me that today does not necessarily define your tomorrow. I might be down today, but tomorrow I’m back up, I’m re-energized. Here I go again, and here you are with me, and this is what we’re going to do. All the divisions that have come about were created. They were created by somebody with a hidden agenda — for their personal benefit, and not the benefit of the masses. And that’s the reason we’re here. I personally believe that places like this can bring us closer to that ideal just by giving people a space where they can just be themselves with each other. We’re all learning together. If I don’t know, I’ll ask her. If she doesn’t know, ask her. If they don’t know, ask Google. Together, we can. Looking to make a difference in your community? Check out our Restaurant and School campaigns to see how you can dig into getting more healthy, plant-based foods on menus! Zakiyaa Taylor is a graduate student working for OMD as the North Carolina Field Organizer. As a self-proclaimed mad vegan food scientist, she can be found in her kitchen gleefully making seven versions of the same dish. In her spare time, she loves binging Netflix and going on long walks to enjoy the beautiful nature North Carolina has to offer.